U.S. District Judge Susan Illston of San Francisco dismissed a lawsuit by conservative radio talk-show host Michael Savage against a Muslim rights group that reprinted his attacks against Islam. Thanks to the court’s ruling you can listen to the over the top rant at the center of this dispute. Judge Illston supported the doctrine of Fair Use, saying that anyone who listens to a public broadcast is entitled to take excerpts and use them for purposes of comment and criticism. Reprinting small portions of a copyrighted work for those purposes helps to put it in context and benefits both the public and the target of the criticism. She also noted that there was no evidence of harm to Savage’s ability to market this broadcast. Countering misguided anger isn’t an academic or self-righteous diversion. Last week, 58-year-old Jim Adkisson entered the Tennessee Valley Unitarian Universalist Church during a children’s performance of the musical “Annie Jr.” and began a shooting rampage. He reportedly brought over seventy shells, and left a note that he’d come to kill liberals. 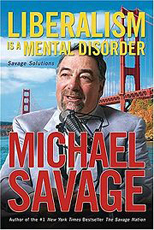 Knowing he’d not be coming home, he left the door unlocked for authorities, where they found, among other conservative publications, Liberalism is a Mental Health Disorder by Michael Savage. Is this guilt by association? Or simply judging a tree by its fruit?